The Seattle Mariners are an American professional baseball team based in Seattle, Washington. Enfranchised in 1977, the Mariners are a member of the Western Division of Major League Baseball's American League. Since July 1999, the Mariners' home ballpark has been Safeco Field, located south of downtown Seattle. From the team's inception in 1977 until June 1999, the club's home ballpark was the Kingdome. Through the 2013 season, the franchise has finished with a losing record in 26 of 37 seasons. The "Mariners" name originates from the prominence of marine culture in the city of Seattle. They are nicknamed "the M's", a title featured in their primary logo from 1987–1992. The current team colors are Navy Blue, Northwest Green, and Metallic Silver, after having been Royal Blue and Gold from 1977–1992. Their mascot is the Mariner Moose. The organization did not field a winning team until 1991, and any real success eluded them until 1995 when they won their first division championship and defeated the New York Yankees in the American League Division Series. The game-winning hit in Game 5, in which Edgar Martínez drove home Ken Griffey, Jr. to win the game in the 11th inning, clinched a series win for the Mariners, and has since become an iconic moment in team history. The Mariners are one of eight Major League Baseball teams without a World Series title, and one of two (along with the Washington Nationals) to never have appeared in a World Series. Owned by Nintendo of America, the Mariners are one of three Major League Baseball teams under corporate ownership; the other two are the Atlanta Braves and the Toronto Blue Jays. The Mariners were created as a result of a lawsuit. In 1970, in the aftermath of the Seattle Pilots' purchase and relocation to Milwaukee (as the Milwaukee Brewers) by future Commissioner of Baseball Bud Selig, the city of Seattle, King County, and the state of Washington (represented by then-state attorney general and later U.S. Senator Slade Gorton) sued the American League for breach of contract. Confident that Major League Baseball would return to Seattle within a few years, King County built the multi-purpose Kingdome, which would become home to the NFL's expansion Seattle Seahawks in 1976. The name "Mariners" was chosen by club officials in August 1976 from over 600 names submitted by 15,000 entrants in a name-the-team contest. 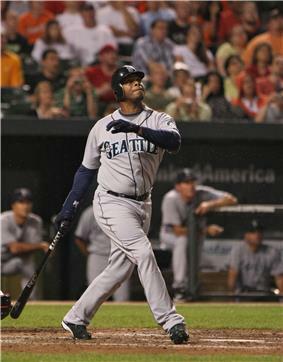 Ken Griffey, Jr. holds six single-season batting records and an individual career record for the Mariners franchise. The Mariners played their first game on April 6, George Argyros. In 1993, the Mariners donned their current uniforms. During the 1992–93 offseason, the Mariners hired manager Lou Piniella, who had led the Cincinnati Reds to victory in the 1990 World Series. Mariner fans embraced Piniella, and he would helm the team from 1993 through 2002, winning two American League Manager of the Year Awards along the way. On October 22, 2008 the Mariners announced the hiring of Jack Zduriencik, formerly scouting director of the Milwaukee Brewers, as their general manager. Weeks later, on November 18, the team named Oakland Athletics bench coach Don Wakamatsu as its new field manager. Wakamatsu and Zduriencik hired an entirely new coaching staff for 2009, which included former World Series MVP John Wetteland as bullpen coach. The off-season also saw a litany of roster moves, headlined by a 12-player, 3-team trade that included sending All-Star closer J. J. Putz to the New York Mets and brought 5 players—including prospect Mike Carp and outfielder Endy Chávez from New York and outfielder Franklin Gutierrez from the Cleveland Indians—to Seattle. Many of the moves, like the free agent signing of Mike Sweeney, were made in part with the hope of squelching the clubhouse infighting that plagued the Mariners in 2008. It also saw the return of Seattle favorite Ken Griffey, Jr. The 2009–10 offseason was highlighted by the trade for 2008 American League Cy Young Award winner Cliff Lee from the Philadelphia Phillies, the signing of third baseman Chone Figgins and the contract extension of star pitcher "King" Félix Hernández. On June 2, 2010 Ken Griffey, Jr. announced his retirement after 22 MLB seasons. On August 9, 2010 the Mariners fired field manager Don Wakamatsu along with bench coach Ty Van Burkleo, pitching coach Rick Adair and performance coach Steve Hecht. Daren Brown, the manager of the AAA affiliate Tacoma Rainiers, took over as interim field manager. Roger Hansen, the former Minor League catching coordinator, was promoted to bench coach. Carl Willis, the former Minor League pitching coordinator, was promoted to pitching coach. On November 10, 2010, Dave Niehaus, the Mariners' play-by-play announcer since the team's founding, died of a heart attack at the age of 75. In memory of Niehaus, Seattle rapper Macklemore wrote a tribute song called "My Oh My" in December 2010. He performed the song at the Mariners' Opening Day game on April 8, 2011. On April 21, 2012, Philip Humber of the Chicago White Sox threw the third perfect game in Chicago White Sox history against the Mariners at Safeco Field in Seattle. It was the 21st perfect game in MLB history. On June 8, 2012, the Mariners starting pitcher Kevin Millwood and five other pitchers combined to throw the tenth combined no-hitter in MLB history and the first in team history. The last combined one occurred in 2003, when six Houston Astros no-hit the New York Yankees in New York. The six pitchers used in a no-hitter is a major league record. On August 15, 2012, Félix Hernández pitched the first perfect game in team history, shutting down the Tampa Bay Rays 1-0 at Safeco Field. It was the 23rd perfect game in MLB history. The team mainly plays spring training games in Peoria, Arizona at the Peoria Sports Complex. They share the complex and stadium with the San Diego Padres. On March 25, 2013, in a 16-0 victory over the Cincinnati Reds, the Mariners broke the team record for total home runs during a spring training season with 52. This is a partial list listing the past 15 completed regular seasons. For the full season records, see here. Lost ALCS vs New York Yankees, 4–2. 2004 63–99 .389 4th Ichiro had 262 hits, which broke the 84-year-old hit record. 2008 61–101 .377 4th Worst record in AL heading into All-Star break, first team of 2008 to record a 100-loss season. 2011 67–95 .414 4th Pitchers Félix Hernández, Brandon League, and Michael Pineda were named all-stars, but only League and Pineda appeared in the Major League Baseball All-Star Game. 2013 71–91 .438 4th Despite the Major League debuts of top prospects Nick Franklin, Mike Zunino, Brad Miller, Taijaun Walker and James Paxton, the Mariners once again failed to make the postseason. Although the Mariners took a major step forward in the power department, hitting the second most home runs in the American League (188 trailing Baltimore's 212), hitting fundamentals, questionable defense and a shallow pitching rotation and bullpen held the team back. On September 27, manager Eric Wedge announced that he would not return for the 2014 season. He was replaced by Lloyd McClendon. The following elected members of the Baseball Hall of Fame spent part of their careers with the Mariners. None is depicted on his plaque wearing a Mariners cap insignia. The Seattle Mariners have not retired any uniform numbers. Official team policy states that a number may only be retired for a player in the National Baseball Hall of Fame who played for at least five years with the Mariners, or a player who comes close to such election having spent "substantially his entire career with the Mariners." Despite not officially retiring any numbers, the team has not reissued the numbers 11 (Edgar Martínez), 14 (Lou Piniella), 19 (Jay Buhner) or 24 (Ken Griffey, Jr.) to any uniformed staff since the last player to have worn the number left the team. Under current team policy, Martinez, who played his entire major-league career in Seattle and first appeared on the Hall of Fame ballot in 2010, is the only player who may be eligible to have his number retired. His best Hall of Fame voting figures came in 2012, when he received 36.5% of the vote (75% is required for induction). Whether this constitutes coming "close" to Hall of Fame election is unclear. Uniform number 00 is presumed off-limits, as it has been worn by the Mariner Moose since 1997 (outfielder Jeffrey Leonard was the last player to don 00 for the M's, in 1990). From 1990 to 1996, the Moose wore the last 2 digits of the year of the current season. Number 51, worn by Randy Johnson, was withheld from players from 1998 until 2001, when it was issued to Ichiro Suzuki upon his request after wearing it for his entire career in Japan. It has presumably been taken out of circulation again, following Ichiro's 2012 trade to the Yankees. The number 24 was not issued from the time Ken Griffey, Jr. left the team after the 1999 season until it was re-issued to him when he returned in 2009 and has not been reissued since his retirement in 2010. 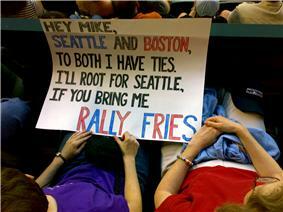 However, on the next game, fans made signs and boards, asking Blowers for free fries as well. Coincidentally, every time the fries were delivered, the Mariners seem to score or rally from a deficit, and thus the "Rally Fries" were created. This became so popular with the fans that signs were even seen when the Mariners were on the road, though on August 1, 2009, Blowers mentioned he doesn't award winners on the road. Generally, Blowers will select a person or a group of people that appeals to him, whether it is through fans wearing elaborate costumes or waving funny signs and boards. The fries are usually delivered from Ivar's, a Seattle-based seafood restaurant with a location at Safeco Field. The amount of fries given out varies with the size of the winning group of fans. The winners are generally selected around the 5th or 6th inning, although potential candidates are shown in almost every inning beforehand. 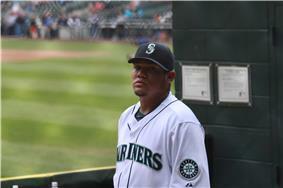 As the 2011 season progressed, the Mariners marketing staff came up with an idea to encourage the growing fanbase of Cy Young-winning pitcher "King" Félix Hernández. Every Hernandez start at Safeco Field is now accompanied by a King's Court section—a place for his fans to sing, dance and cheer while donning custom-made shirts and K cards. The King's Court is both a personal rooting section for Hernandez and trend-setter for Safeco Field. The team encouraged fans to dress like Larry Bernandez, Hernandez's alter ego from a Mariners TV Commercial, or show up in wacky costumes, rewarding the best with a ceremonial turkey leg. Supreme Court The Supreme Court is when every game attendee is given a free King's Court T-shirt and a K card, and only occurs at special events. The first Supreme Court was Félix's first home game following his perfect game in 2012. Since then it has occurred each year at Félix's first home game. The Mariners' flagship radio station is KIRO-AM 710 (ESPN Radio), which previously broadcast Mariners contests from 1985–2002. Former flagship stations include KOMO 1000 AM (2003–2008), and KVI 570 AM (1977–1984). Television rights are held by Root Sports Northwest. In years past, Mariners games have also appeared in Seattle on over-the-air stations KING-TV, KIRO-TV, KTZZ-TV, and KSTW-TV. Selected Mariners games are also available on Canadian television, due to an agreement between Root Sports Northwest and Rogers Sportsnet. The Mariners' broadcast team for 2010 featured Dave Niehaus and Rick Rizzs—back for their 32nd and 23rd seasons with the club, respectively—as well as veteran broadcaster Dave Sims and former infielder Mike Blowers. For the first three innings of each game, Niehaus worked the television broadcast with Blowers, and Rizzs and Sims handled radio duties; after the third inning, Niehaus and Sims traded places. Niehaus, who had broadcast for the Mariners since their inaugural season of 1977, died on November 10, 2010. For the 2011 season, Dave Niehaus' duties in the broadcast booth were filled by a collection of former Mariners broadcasters such as Ron Fairly, Ken Levine, and Ken Wilson; and former Mariners' players such as Dave Valle, Dan Wilson, Jay Buhner, and Dave Henderson. Since 2013, Aaron Goldsmith joins Rizzs calling games on the radio, while Sims and Blowers anchor the television broadcasting. Seattle radio personality Matt Pitman hosts the post-game show on the Mariners' radio network, along with clubhouse reporter Shannon Drayer. Spanish-language radio broadcast duties are handled by Alex Rivera on play-by-play and former second baseman Julio Cruz providing color commentary. Tom Hutyler has been the Mariners' public address announcer since 1987, first at the Kingdome, and presently at Safeco Field. While KOMO 1000 AM was the Mariners' flagship radio station, Hutyler occasionally hosted the post-game radio show. ^ "Griffey Jr. announces his retirement". ^ Stone, Larry (2012-10-27). "Mariners broadcaster Dave Niehaus dies". ^ Liebeskind, Josh (2012-04-21). "MLB.com Gameday | whitesox.com: Gameday". ^ Greenberg, Chris (22012-08-15). "Felix Hernandez Perfect Game: Mariners Ace Records 27 Straight Outs In 1-0 Win Over Rays (VIDEO)". ^ Munshi, Sonu (2012-03-05). "Peoria renews spring training lease with Mariners, Padres". ^ "Mariners Set Club Spring Home Run Record in Route of Reds". ^ Eaton, Nick (January 17, 2012). "Randy Johnson, Dan Wilson headed to Mariners Hall of Fame". Seattle Post-Intelligencer. ^ Mailbag: Bloomquist at second? ^ Hansen, Patrick (2011-05-15). "Seattle Mariners: 5 Best Safeco Field Traditions". ^ Floyd, Brian (2011-06-29). "Felix Hernandez Ignites King's Court; Mariners, Marlins Play Calvinball".